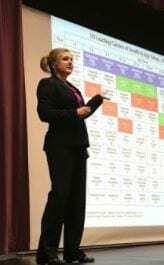 DAHLONEGA, Ga. — It was a somber crowd that gathered in the Lumpkin County High School Auditorium Tuesday evening to hear Dr. Janice Darnell deliver a poignant but vitally important message in the wake of one of the most tragic weeks in the school’s history. By now, the entire Lumpkin County community knows that in two separate, but related incidents, last week, two LCHS students ended their own lives and another overdosed in an apparent attempt to commit suicide. Out of respect for the victims, their families and their privacy, Fetch Your News will not mention the names of those students. her goal was to help people recognize the warning signs and risk factors associated with suicide. “No family is immune from this,” she said. Using the most recent figures from the Center for Disease Control from 2014, Darnell pointed out the second leading cause of death among Georgians between the age of 25 and 34 is suicide. In that same year, 18 percent of high school students reported seriously considering suicide, 15 percent reported making a serious plan to commit suicide and 9 percent reported making an attempt to commit suicide. Lumpkin County ranks 43rd of 159 Georgia counties in death by suicide. “There is no single path that leads to suicide,” she said. Some of the causes include serious mental illness, sickness, abuse, painful emotional loss and exposure to violence. “Ninety percent of those who have died by suicide have some type of a treatable mental illness.” She also pointed out the importance of recognizing risk factors or symptoms. Some symptoms of mental health issues can include a sudden, unexplained drop in grades, unusual behavior, interaction with peers, someone who was very outgoing suddenly becomes introverted. A drastic change in appetite, decreased energy, expressed feelings of “no worth” or writing about dark subjects should also send up red flags. Bipolar disorder is one of the leading causes of mental illness. Some important facts about mental illness include the following: One in five Americans experience some form of mental illness, nearly one in 25 adults live with a serious mental illness, half of chronic mental illness begins by the age of 14 and 75 percent begins before the age of 24. Tragedy has a way of bringing communities together and that appeared to have been the case last night as parents, students, educators, clergy, concerned citizens law enforcement officers and elected officials were all there to educate themselves on how to prevent such a tragedy from ever happening again.